Clear Chalk Paint Wax, formally known as Soft Wax: THIS IS THE SAME PRODUCT! Just new branding! This is the smaller container of Clear Wax that Annie Sloan offers. Annie Sloan's 4.22ounce MINI Wax Pots! (120 ml) This is a SMALL POT- (enough to cover 2 chairs) If buying a quart of paint- you really should buy the 500ml tin of wax HERE. COVERAGE: A mini wax pot should cover about 80 to 100 sq ft of one application. Please let me introduce you to our mini wax pots! Coming in at only 4.22 ounces- this size will be the perfect stocking stuffer! OR- for those who just want to test the waters with using wax and do not want to commit to the full 500 ml tin. A mini wax pot is perfect for a couple of chairs. This is NOT enough to do a hutch or a bedroom suite. The 4 ounce Soft Wax sample tins offer 25 square feet of coverage and come in CLEAR and DARK wax versions. Both waxes offer protection for the paint and enhance the paint color and look & feel of the finish. The DARK wax can be used as an antiquing medium over the paint (usually applied on top of a clear wax base) or as a stain-and-seal directly over unfinished wood. Annie Sloan Clear Wax is the consistency of soft margarine in a tub so it is easy to apply, is completely colorless and has very little odor. It is water repellent so can be used on dining room tables and kitchens. Wipe clean regularly and use a spray cleaner for tough areas - but make sure it does not contain a de-greaser - which will hurt the wax. And we suggest applying the paint, waxing it and then sanding it for the best results. You can color the wax with a little of our paint to make a white wax. 2. I use my wax brush and pull some of the wax from the glob (for lack of better words) on the paper plate. Only the tips of your wax brush should have wax on them - and not a lot!!!! A little goes a long way! Again - you are not icing a cake where you want a generous amount of thickness. We are applying the wax very thin- pressing uniformly with steady pressure - but not so much that you are bending the bristles on the wax brush or breaking a sweat. 3. For most pieces I usually apply the clear wax in a circular motion, but some people like to "brush" it on like when they are painting. Either way, if I was doing a dresser top- I would start at the back reaching across while standing in front of the piece and as I apply the Annie Sloan wax I work my way toward the front as so I don't lean into a previously waxed area. You will see where you waxed prior because it does deepen the hue of the paint. 4. After a few strokes from one side to the other with the wax brush, I then take a lint free cotton t-shirt (an old one from my husband or an old sheet) and I wipe off the residual wax with a few wipes. Then, I grab a new, clean cloth (we like to refer to this as the "finishing rag.".) And we will wipe the waxed piece in the same direction as we originally painted. Basically, in this step- we are just making sure the wax is nicely cleaned off totally. You should be able to take the top of your hand after this and slide it across the waxed area. It should glide withOUT any drag. If you feel resistence- that means there is still some residual wax there. Just a reminder- we are waxing only here= NOT buffing the wax at this stage! Merely just removing or incorporating any small wax "crumbs" that may be present.) Again - just one or two swipes across the whole area in one sweep, and that is it. 5. Then, start waxing the next area. It is important during the "finishing" wipe stage to BLEND any previous waxed areas with the new section you just did. You want the wax to be cohesive- not splotchy. 6. The wax will cure. However a variable in the cure time is the temperature and humidity where you are located. Is it is humid and cooler - cure time will be longer. If it is taking a long time and your wax is still tacky and you are not in the rain forest- reread my warnings above regarding applying the wax thin! You may have left too much on. 7. If you want a shinier finish- buff your piece. Annie often recommends waiting 24 hours after your last wax application to do this. But if you like the look of your piece as is- then you are done! It does not take much rubbing and the piece will be quite shiny- so pay attention and have good lighting so that you do not over do it. Clear wax is quite versatile in that you can add some Chalk Paint® to the wax to tint it. 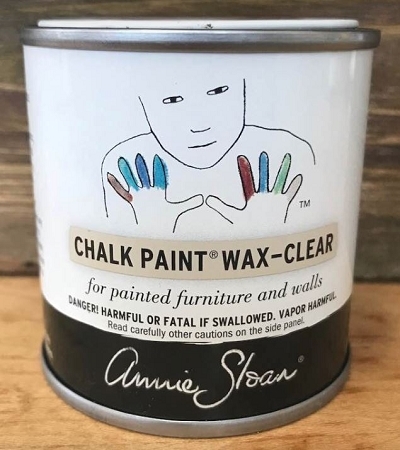 For example, use Antoinette Chalk Paint in the clear to make pink wax or ....if you want to darken the Dark Wax, consider adding some Aubusson Blue Paint to make the dark wax closer to black. 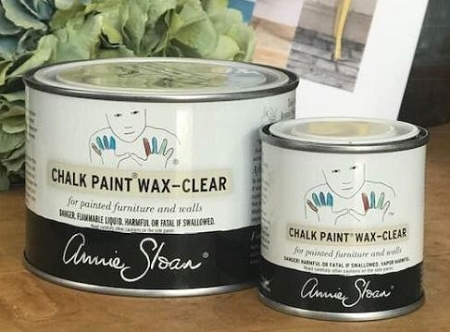 Consider taking a class from a stockist to learn all the ways to maximize using your Annie Sloan Clear Wax or for more terrific project ideas - we highly recommend Annie Sloan's book, "Quick and Easy Paint Transformations". It contains 50 Chalk Paint projects that will inspire and instruct you.